Aspiring racecar driver Kate Reilly goes looking for a full-time ride in the American Le Mans Seriesand stumbles over a dead driver. When she takes that driver's job just hours later, she also takes pole position on the list of suspects in his murder. Suddenly she's in the hot seat with little time to clear her name and get ready to race a Corvette at Lime Rock Park. Amidst suspicion, Kate buckles down, quickly getting to know the racecar and team, bumping into plenty of suspects who might have committed murder. Clues fly at her as fast as the turns on the track, including a cryptic list of blackmail victims, unexplainable car performance at racing speed, a jealous husband with an adulterous wife, and drivers and crew who are openly happy her predecessor is dead. Kate finds exhilaration and hazards exist on- and off-track as she throttles up both the Corvette's V8 and a murder investigation. The green-flag countdown ticks away, and Kate must decide who she can trust to help probe alibis, untangle rumors of team breakups and personal betrayals, and determine whose drive to win also constitutes a willingness to kill. Because what's at stake in Kate's race to the truth is her career ... only by uncovering a murderer can Kate restore her reputation and prove she belongs in the racing world. "[A] winning debut... Even those unfamiliar with this world will appreciate Kaehler's vivid descriptions of the intricate teamwork involved in racing, the amazing equipment, the split-second decision making required of the driver, and the pulse-pounding race itself." "... breathless prose and vivid descriptions. Kaehler's clear explanations of technical jargon make the racing world come alive. An engaging debut; I can't wait to see where Kate and the crew go next." "Kaehler's debut wraps the reader in layers of racing detail..."
"Rookie racecar driver Kate Reilly knows she didn't kill Wade Becker, but when she takes his place in the American Le Mans Series, the rumor mill starts spinning faster than the wheels of her new Corvette. Desperate to clear her name, she begins her own investigation, putting not just her career at risk but also her life. L.A. pumps out standard-issue whodunits with the regularity of racetrack car accidents. What sets Tammy Kaehler's first-time effort apart is its slam-bang setting—and the ease with which this former technical writer renders descriptions of her fancy equipment." "A tale of mystery and intrigue that involves Corvettes and racing will often move high on a recreational reading list...[Kaehler] became interested in racing after a visit to a hospitality suite. That day led to intense research and a quest for accuracy that will appeal to the knowledgeable race enthusiast." "... chock full of [good drama]. The characters were full of life and completely believable. Kate was aggressive but not pushy, and she didn't make a big deal of being a 'female driver' ... which quickly gets old. I really hope this becomes a series." "Pedal to the metal from start to finish, Tammy Kaehler's sensational debut is a high-octane whodunit so real you can smell burnt rubber and racing fuel. Displaying a veteran's writing skills, Kaehler's Kate Reilly series is off to a jackrabbit start!" "Every sport has its dark side and Tammy Kaehler blows the lid off the world of motorsport." "Dead Man's Switch is a great read whether you're a NASCAR fan who never reads mysteries or a mystery fan who knows nothing about racing. And if you love both cars and crime fiction, it's a must-read. Kate Reilly is smart and tough and engagingand she sure can drive. And Tammy Kaehler sure can write." "Tammy Kaehler's debut novel, Dead Man's Switch, takes the reader on a glorious spin through the fascinating, dangerous world of sports car racing. Her heroine, Kate Reilly, is smart, believable and resourceful, an up-and-comer in the high stakes world of fast cars, fast living, and sometimes deadly competition. Fasten your seat belts and get ready for one high-G-force read." "A wild ride with treacherous twists and threatening turns. I was captured by her exquisite writing, her ability to depict that world so vividly, and her skill in weaving a complicated but believable plot." "With Dead Man's Switch, Tammy Kaehler has brought the suspense world a whole new genrecar racing! 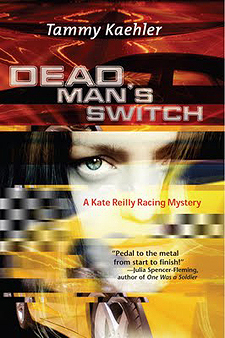 Whether you know nothing about the sport or follow it closely, Dead Man's Switch puts you on the track, behind the wheel, in the pits, and everywhere else as new heroine Kate Reilly tries to solve a murder that could end up taking her job, her freedom, or even her life. Trust me: You'll want to be there when the checked flag comes down." "Kaehler's first novel, Dead Man's Switch, has a true and excellent narrative voice, an authentic knowledge of car racing, and a tale that is both intriguing and satisfying. The racing scenes are terrific!" "The racing scenes portray an accurate and authentic account of what it is like to drive a racecar in the high-pressure world of professional motorsport. An insider's perspective ... it captures the true essence of what goes on at the racetrack."